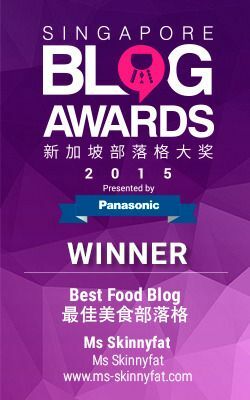 Nose-to-tail eating doesn't seem to have taken off in the majority Chinese populated Singapore. I find it strange because we Chinese are (supposedly) familiar with offals and innards (hello kway chup), so much that we even eat that for breakfast (sometimes). It thoroughly surprises and bewilders us that a gorgeous Spanish restaurant like Dehesa isn't packed every night (like Esquina). Perhaps they have gone overboard with their marketing of their "inner" beauty? For those who are intimidated by the alternative cuts and random parts, your fears are unfounded. 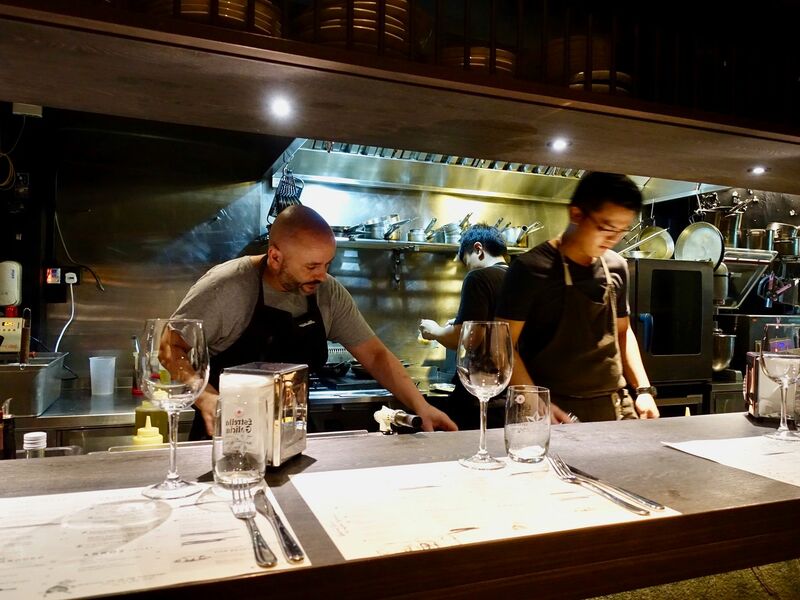 Chef-Owner Jean-Philippe Patruno aka JP, previously of Bomba Paella Bar and Una, fires up more than just the grey matter. Classic Spanish dishes are available here and he's more than adept at delivering them. 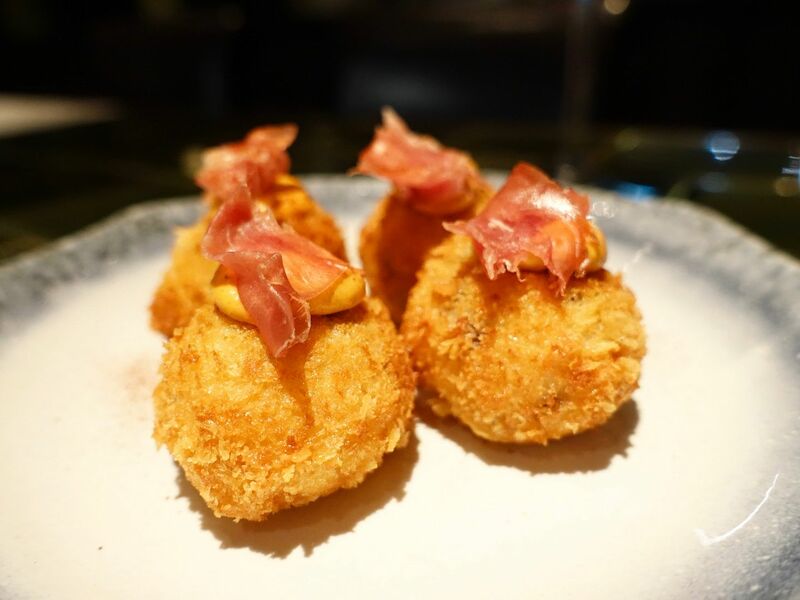 I let my weakness for Croquetas (4 pcs, $14) take over and swooned in bliss as I bit into the creamy filling encased in the crunchy panko crust. This is one smooth morsel! Make sure you give it a good chew together with the spiced paprika aioli and jamón joselito. I struggled with my need to finish this and saving space for my main meal. That should ease you into starters. If you don't go into the nitty gritty, the Dehesa platter of cold meats ($32), is what you would likely order at any other restaurant- a rotating homemade charcuterie consisting pate, lardo, deep-fried pork scratchings. We all know where the ingredients are from, we don't need to be told/reminded, other than how good they taste. 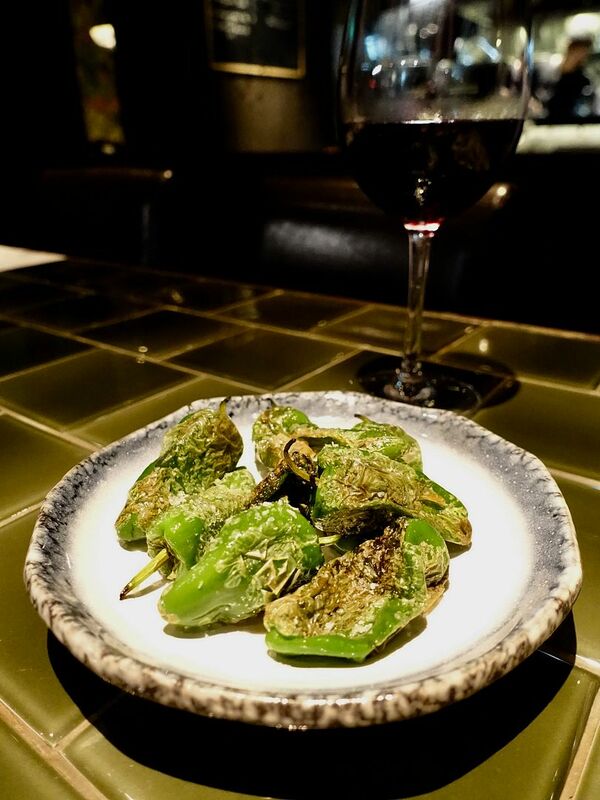 Well if that doesn't go down well, take a few bites of the smoky Pimientos De Padron ($14). They will sure cleanse the palate of any gamey leftovers. 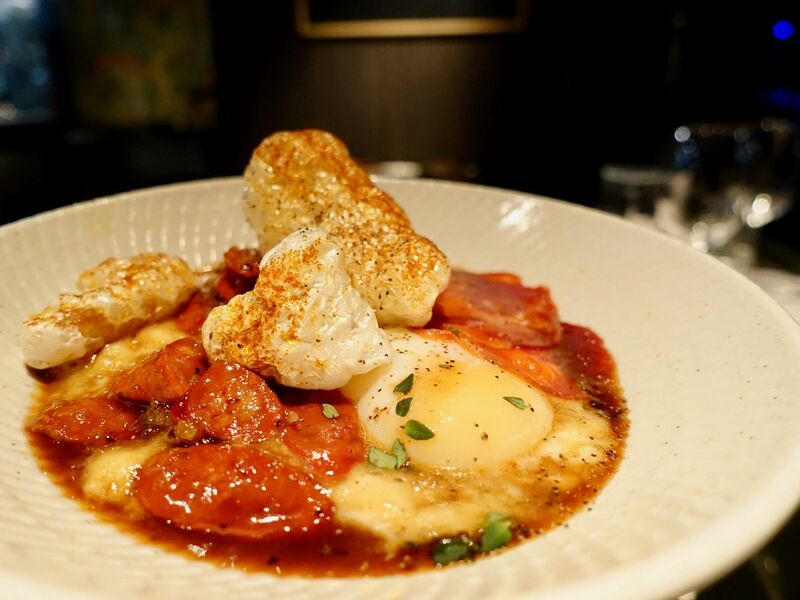 If you're not for the cold platters, have the Chorizo ($24) which is served with soft cooked eggs and a smoked mash, and pork crackling! This comfort food combination never fails. If only I could find some bread to go with this. 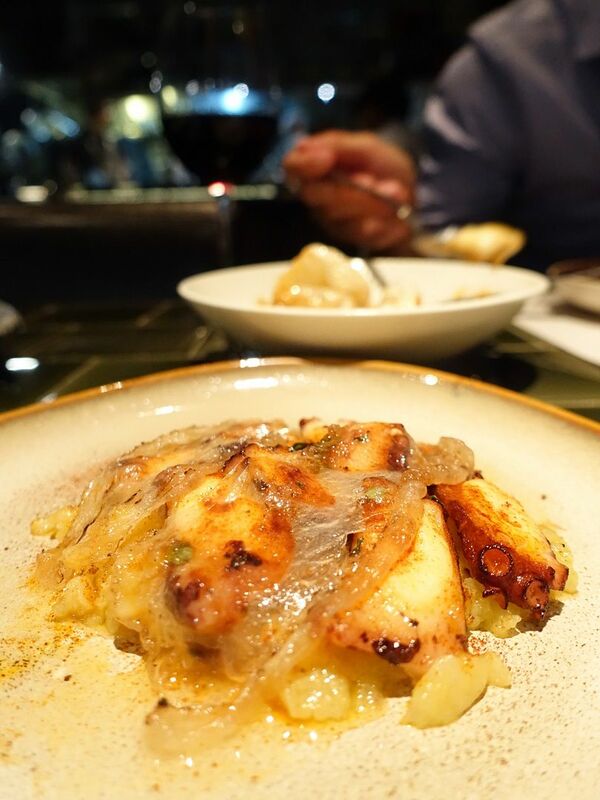 The Dehesa Octopus ($28) was one of my favorites! The tentacles were tantalizingly tender and well seasoned. They are served on a bed of crushed creamy potatoes with some sour bits (I couldn't figure out they were pickles). A thin slice of lardo (cured lard) tops the dish and is torched upon service. This provided a salty smoky note to the dish. Too good!! 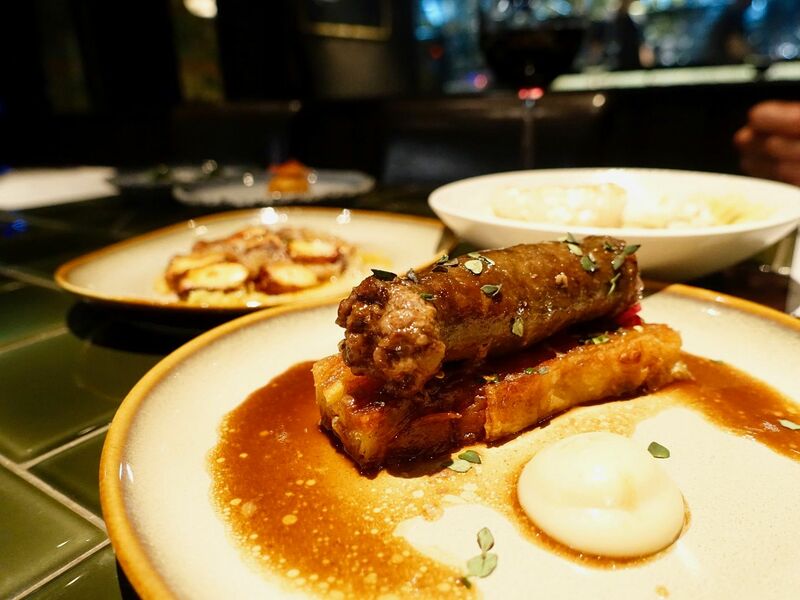 From the Specials menu, we had the Figateddu Pork Sausage ($17) which is made with blood and liver. We were warned of the strong flavors but I was more shocked by the how salty my dish was. The liver and blood part was a walk in the park really. It was tasty no doubt, especially that crunchy potato galette which is like a deep-fried Kouign Amann! To balance the saltiness, have one of the vegetable dishes. 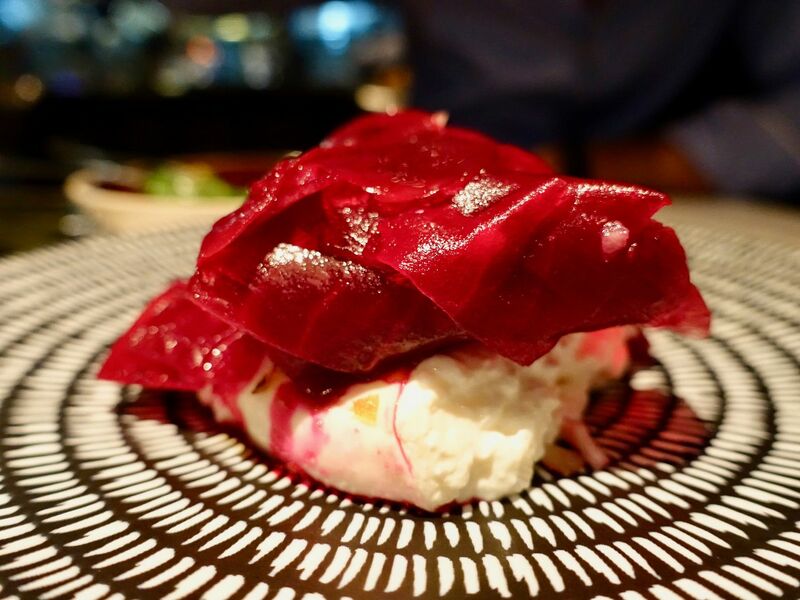 We had the light tasting Beets ($24) which featured a round of fresh burrata with pickled beetroot and toasted walnuts. Mild it was, but we needed to calm our tongues before moving on. 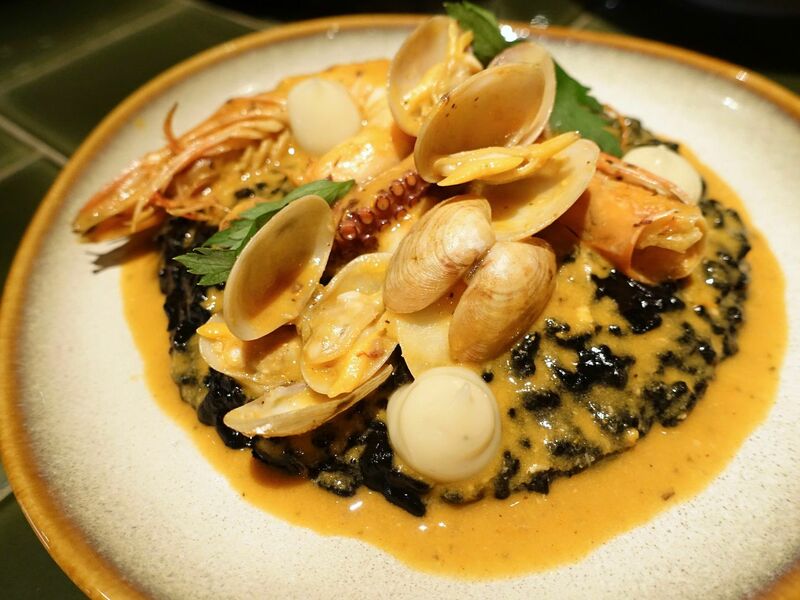 Another highlight of our dinner was the Squid Ink Arroz ($28 serves 2). The short grain Cebolla rice has absorbed all the lovely seafood flavors and then topped with an umami-rich seafood sauce. Superb seafood on that lightly spiced black rice btw. From the Specials Menu, we also had the Braised Beef Cheeks ($36) with an Oloroso glaze. The meat was well flavored by the red wine and had a gelatinous texture to it. We also had the Bone Marrow ($34) served with sea salt. 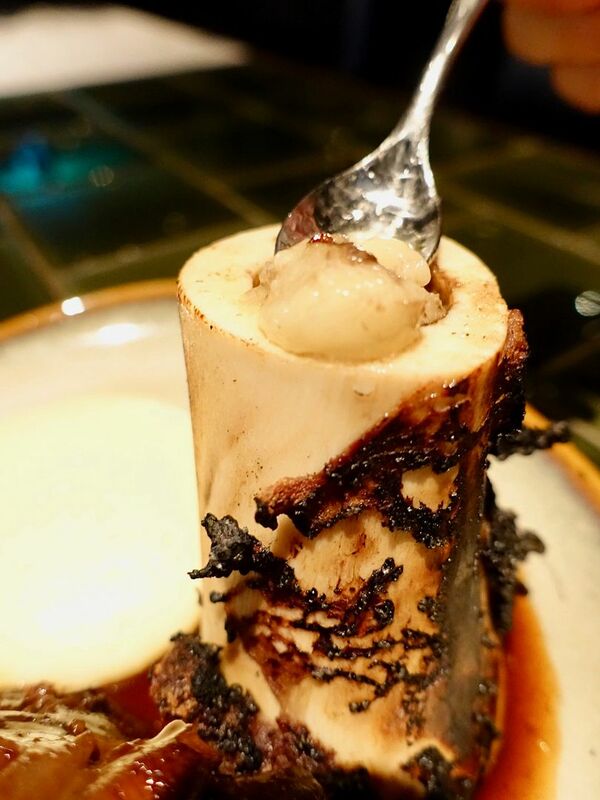 Well i absolutely don't get the appeal of bone marrow. It's tasteless! Anyway, the one at Dehesa was bland and oily for me. Perhaps it has to do with the way it's prepared. If the bone were sliced into halves, the fatty collagen would be flavored more easily. Instead of the bone marrow, i'd go with the Crispy Suckling Pig ($65 quarter/115 half/199 whole pig) next time. Try it and let me know! For the whole pig, make sure you place your order beforehand. 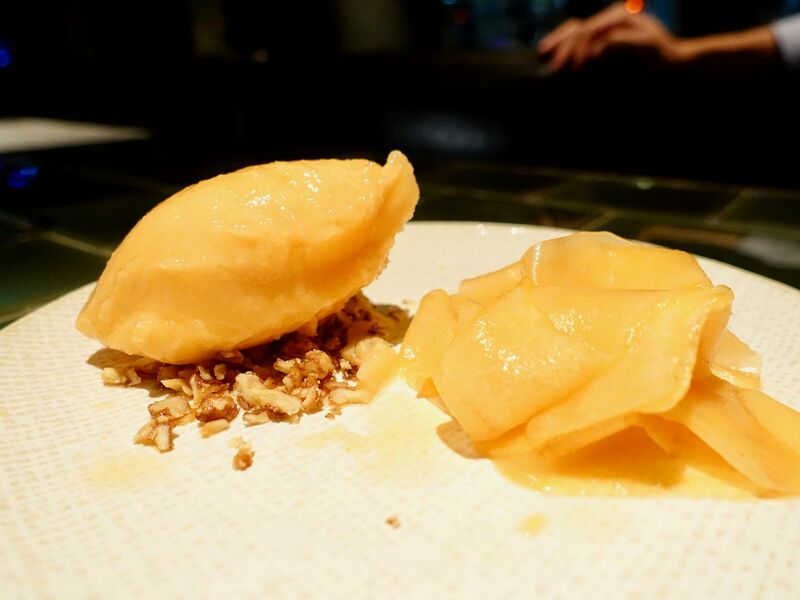 For desserts, we had the Melon Sorbet ($14) which was spiked with negroni! 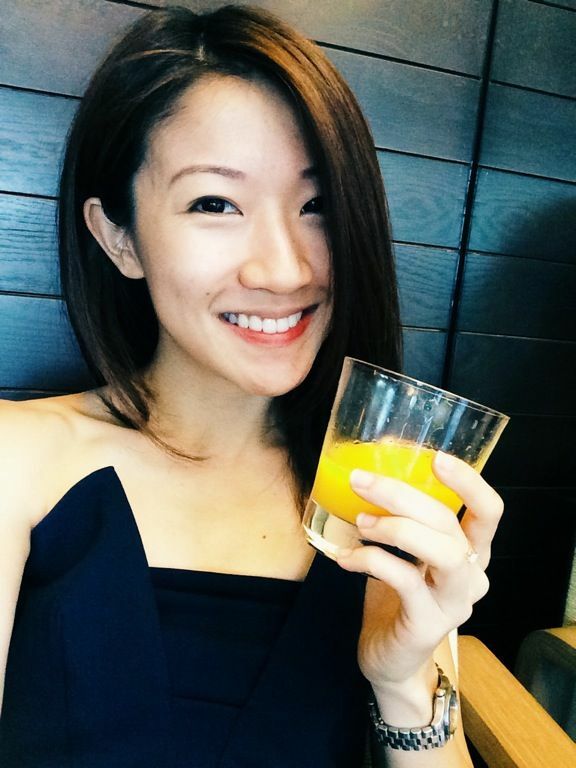 This is made in house by Chef daily and i liked that it wasn't too sweet. 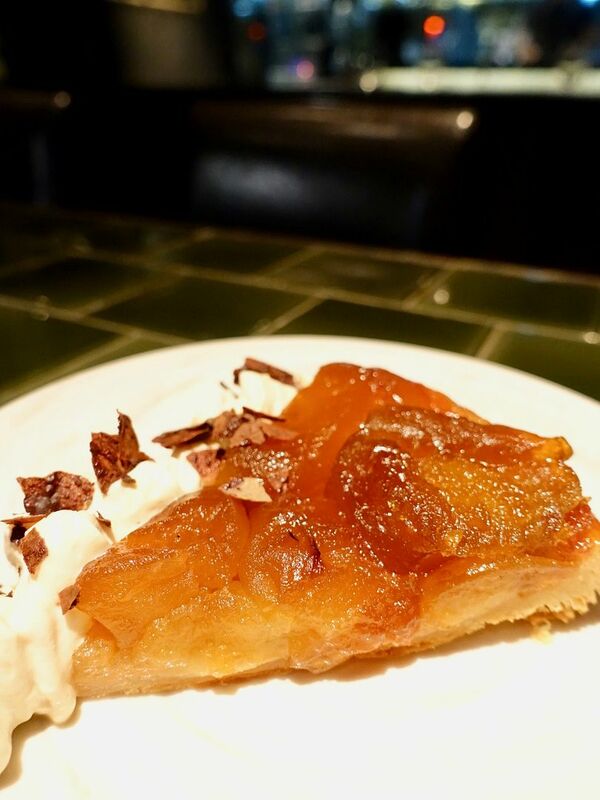 Dehesa also has a Daily Tart on the menu and it was Apple Tart ($12) when we visited. The soft caramelized apples were almost jam-like and i enjoyed the tartness of the fruit. We were pretty sure there's some alcohol in this! Please go visit Dehesa if you want a good Spanish meal! I'm not paid to say good things about them but i really feel that they are super underrated. 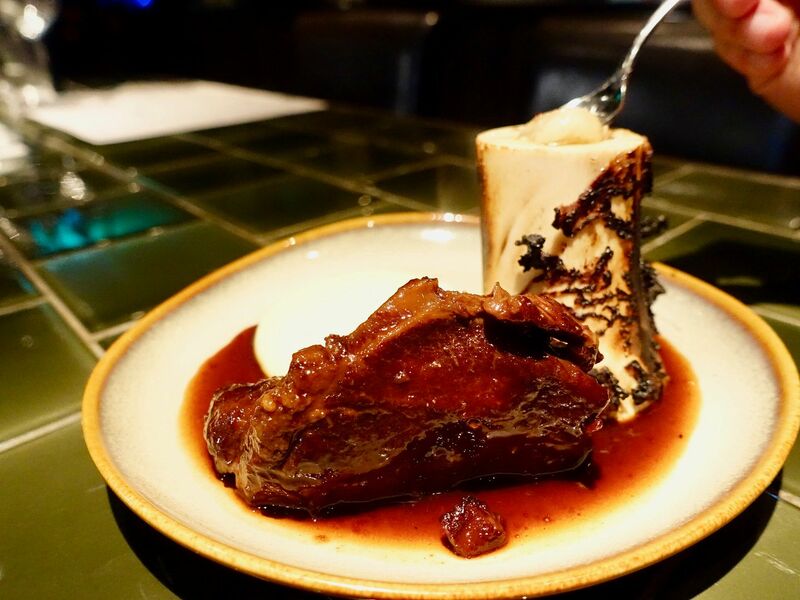 There's no need to be intimidated by the nose-to-tail concept really, Dehesa is that and more.